These daycare strollers are designed for the ultimate in safety, ease of use, durability and value. What is a good stroller for a daycare center? Whether you are taking a trip to the park or simply going out for a stroll, a great multi-child stroller makes outings simple. Not only will the kids love to ride in our six-child, triple or quad strollers, but these buggies are actually easy to push and surprisingly maneuverable. Keep every child safe and happy in these neat daycare strollers. Our selection offers a number of great choices that will satisfy children and caregivers alike. Where can you get Angeles quad strollers? 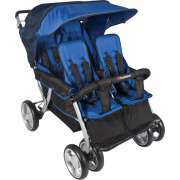 Angeles daycare strollers are built with tough unibody construction for many years of group trips. They are available in both four- and six-seater options. 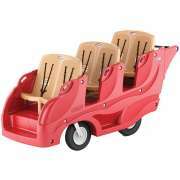 Their 360-degree pivoting front wheels and large comfortable handle make them easy to push and maneuver. Where can I get a Bye Bye Buggy? The Bye Bye Buggy is a great choice for a daycare center that serves children of various ages and sizes. It accommodates children from five months to three years and even has the option of an infant seat to adapt for younger children. Little ones and their caregivers will just love traveling around in style as they observe their surroundings. It is important to make sure that the daycare stroller you choose is comfortable to push and steer so caregivers have energy to play with little ones and can enjoy the time outside as well. Should I get a side-by-side or tandem stroller? Multi-seat strollers come with either side-by-side or tandem seating. Tandem seating gives each child a clear personal space and prevents little ones from bothering each other. Side-by-side arrangements are great because they encourage social interaction among children. Sometimes the right choice depends on what will fit through the doorway or take up less space in the building. How can I protect little ones from the sun on outings? A canopy is a helpful option to consider for your daycare buggy. With protection over their heads, children won&apos;t be bothered by sun or rain and will be able to sit longer. Canopies provide a peaceful setting for little ones who are napping, while still enabling children who are awake to enjoy their surroundings from the front or sides. Remembering everyone&apos;s hats when going outside can be a challenging and time-consuming task. A canopy takes the place of a hat so little ones are protected and their caregivers don&apos;t have to spend time running around to find the right headwear. How can I make sure that each child has a good view in the stroller? Stadium seating is ideal in a daycare stroller, especially for older babies and toddlers. Terraced seats give children room to breathe and a clear view. When each child can see what&apos;s up ahead, caregivers can facilitate games like “I Spy” as well as educational letter, number and nature activities on the go. This is a great way to bring learning along for the ride and turn every experience into an educational one. How can I get an affordable tandem stroller? A daycare stroller is a significant investment, so you want to make sure that you pay attention to the small details. Make sure you have great wheels and brakes that can stand up to many years of outings. Safety is another key concern. All of our strollers feature five-point harnesses which keep children securely in place as you roll along. If you need help budgeting for your purchase, contact the Hertz Financing Department for personal assistance. If you want to save space when your stroller is not in use, Foundations multi-child strollers are an excellent choice. They fold up in one piece for compact storage and feature independently-reclining seats and fabric that is easy to clean. 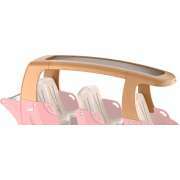 These folding strollers include large storage baskets underneath the seats and are appropriate for babies. The daycare stroller of your dreams has arrived. At Hertz Furniture, we know that striking a balance between caregiver comfort and child safety is of utmost importance, which is why we offer multi-child strollers which give you the best of both. If you are not sure which style is best for you, or you just need help understanding all of the features, don&apos;t hesitate to call the Hertz Design Center for free project-planning advice.